I'm fairly new to Linux. I'm running Linux Mint. After installing SH3D via Synaptic, I can't find the plugins folder, to copy plugins to. I guess that Mint handles the same as Ubuntu (especially if you have the Ubuntu-based version). Then in your home directory there is a hidden folder called ".eteks". In this folder you will find another called "sweethome3d" and in it you will find the directory you are looking for: "plugins". I've been looking, and turned on "Show hidden files". No .eteks folder though. 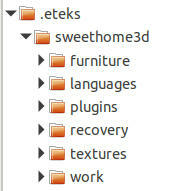 If the folder "plugins" doesn't exist, create it yourself in ./eteks/sweethome3d. Then copy your plugins into that folder. When you start SH3D it will load the plugins it finds in that folder. Thank you, that did the trick. But now SH3D tells me, that the plugin is not compatible with this version of SH3D. I went on, and downloaded the 32 bit version instead. But... Running the terminal script, in the SH3D folder does nothing. A terminal window flashes, and closes. No more. OK, i now have the right x64 bit version. I can click the "PhotoVideoRendering" meny item in SH3D, but nothing happens, when I click it. From the top menu choose Photo-video rendering -> Simple photo rendering (v1.6) and a pop-up window appears that's slightly different from the "normal" rendering window. Oh yes, I understand. But when I click the "photo video rendering" menu-item, the window doesn't pop up. Nothing happens. Now I have made an Ubuntu USB stick, instead of Linux Mint. Exact same thing. Clicking the Video rendering menu-item, then nothing happens, at all. Run Sweet Home 3D from a Terminal window. If the plug-in is incompatible some way, an error should appear in the Terminal window when you select one of its menu items.